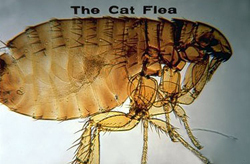 Size: Cat fleas are the most common fleas and reach about 1/6 inch in size. Color: Cat fleas are wingless insects with flattened bodies and long hind legs for jumping. They are black to reddish black in color. Habits: The flat body of the flea allows it to pass easily between an animal’s hairs and it infests both cats and dogs. Pets typically pick up fleas outdoors and carry them indoors where they rapidly reproduce. Fleas are usually most abundant in areas where the pet sleeps. Reproduction: The female lays smooth, oval eggs on the host animal which are dry and easily slide off the animal's body to the surface below. The white eggs are virtually impossible to see against a lawn, carpet or bedding, so they rest on these surfaces until the wormlike larvae emerge. Females produce between 18 and 25 eggs every day at the rate of about one per hour. If a dog has just 10 fleas, they can produce over 1,200 eggs per week. Other Information: Flea pupae are immune to any kind of insecticide and it can take several weeks for the adult to emerge from the pupae and be killed by the treatment. 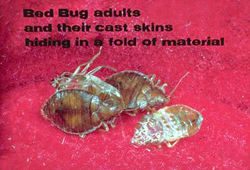 Size: Bed bugs grow to 1/8 to 3/8 inch in length. Other Information: The presence of bedbugs may be determined by a sweet odor in the room. Bed bugs are increasingly being encountered in homes, apartments, hotels, motels, dormitories, shelters and modes of transport. 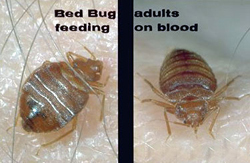 International travel and immigration have probably contributed to the resurgence of bed bugs in the United States. Bed bugs do not fly, but can move quickly over floors, walls, ceilings and other surfaces. Size: Adults are about 1/8 inch long. Color: The rhipecephalus tick is flattened top to bottom, and much wider at the posterior end than the front. There are tiny pits scattered over the top of the body, and the color is somewhat uniform reddish brown. Habits: The rhipecephalus tick is more commonly known as the brown dog or kennel tick and is commonly found on dogs. It can create a serious nuisance in the home when pets become infested. These ticks gorge on a single blood meal at each stage of their lives and remain attached for several days to over a week. 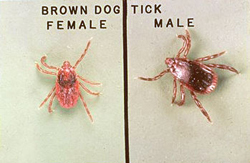 When ticks become fully engorged, they drop off the host and seek a protected area in which to hide. Ticks in all of the life stages may be found behind baseboards, under window and door moldings, in window pulley openings or in furniture. Diet: Rhipecephalus ticks are strictly blood feeders and typically use domesticated pets as their host. Females become enormously bloated when feeding; sometimes swelling to 1/2 inch long. Then they drop off the animal to lay eggs. Reproduction: After fertilization by the male, and a large blood meal, the female produces a single batch of up to several thousand eggs, and then she dies. These eggs are usually placed in a secluded crevice of some sort and are often deposited between boards, under plaster or carpeting, or in other cracks and crevices. The eggs usually hatch in about three weeks and the larvae wait months to find a host. Other Information: This tick is thought to be a vector of Rocky Mountain spotted fever. Adults can live up to 1 1/2 years, without feeding, but must feed before mating.